The 1000 Calorie Diet – Good, Bad or Indifferent? In life there are all kinds of accepted ‘truths’ which are factually incorrect. Fitness and nutrition is full of them… ‘don’t eat carbs after 6’, ‘don’t arch your back when deadlifting’, ‘stretch before exercise’ etc etc. Most of these ‘rules’ turn out not to be true when put to the test, but they still persist in many quarters. There’s another one recently that I wanted to test in nutrition, which was ‘don’t under-eat or you’ll lose your muscle’. I wanted to eat a 1000 calorie diet to see what the effects would be. It contradicts a lot of the research around fasting. All diets are a form of under-eating, so is it really that bad? Who has proved the rule? The thing is, single gram of fat contains 9 calories. If a person was carrying 20kg of fat tissue (which lots of people are), then they have 180,000 calories of potential stored energy in the form of fat tissue. If a man burned 3000 calories per day, theoretically he could live for 60 days on his stored fat reserves alone! There was a case in the 1960’s where a man fasted for 382 days. That’s correct – he lived for over a year without food, under medical supervision. You can read the study here. Using this as a starting point, we know that fasting is absolutely fine. Many people use intermittent fasting anyway, going anywhere between 8 hours and 1.5 days at a time without eating. That’s their daily routine, not a special weight loss approach. Using those examples as a base for comparison, 1000 calories per day is positively gluttonous. It’s been well-known in weight-class sports for a long time that an athlete who has to reach a weight category can survive and perform on low calories. One of the common approaches is to increase micronutrient (vitamins and minerals) intake dramatically to offset any likely issues stemming from low general calorie intake. It works, but it’s certainly not a long-term strategy for an athlete, maintaining extreme low calories with a very high training load. Now, with this in mind I got in touch with a friend of mine, Jordan. He is a sports performance nutritionist for a HUGE (I won’t say which one) nutrition company. He’s my go-to source of nutrition info when I have a question. Before I made my mind up if I was going to experiment with low calories, I thought I’d run it by him. So, there we go. A clinical nutritionist who works with professional athletes says it’s OK.
Next up, I’d have to decide the approach I’d take. Of course the obvious thing is you just eat less, but that’s a little too simplistic. If I’m going to eat little but still perform well, I can’t rely on just filling my pie-hole with garbage. I had to be a little more tactical. I usually eat around 3000 calories per day, so my thinking was to make the experiment a 1000 calorie diet for 5 days. Long enough to see an effect, short enough that the end of the diet was in sight. In reality 5 days doesn’t take a huge amount of discipline, so I opted for that. I decided to start with accepted good practice, which dictates that if you are going to eat very low calories, it’s a good idea to over-compensate with high micronutrient intake. I always take a multivitamin anyway, but in this case I decided to go for an extra powerful multivitamin. BodyNutrition.org has some really great recommendations for choosing the right multivitamin for men and women. Next up was the omega issue. I’m allergic to fish, so I can’t eat it. I do see the value in an omega supplement though, so I look this one…. So that’s my vitamins and minerals sorted. You may argue it’s overkill and in reality, it probably was. Still, I saw it as insurance, following good practice and a case of better being safe than sorry. It worked too, as we’ll go into later in the article. I think it’s important to have a plan when you go into anything like this – it’s such a dramatic change in practice that it can be really, really difficult if you don’t have a strategy before you head into it. Give myself enough energy to train and recover well. Eat only enough to hit close to 1000 calories, but try to avoid hunger. I wasn’t counting my macros, but I was counting my calories. I did that using My Fitness Pal and by checking the labels on food. Given it was only ever going to be a short-term experiment (5 days), I was happy to occasionally go with decent quality ready meal options such as soups etc, mostly because it took the work out of counting the calories for me. I’m a sucker for the convenience, so that won out in the end! On a normal week I’ll train around 5 times and according to my heart rate monitor, I’ll burn anywhere between 500 and 1000 calories per workout, depending on the session. I was willing to accept that and still only eat 1000 calories, given part of the nature of this experiment was the extremity of it all. I needed fuel to train and recover, so decided to base my meal strategy around my exercise – essentially splitting my food intake across two meals, a small one before training and the larger one afterwards. 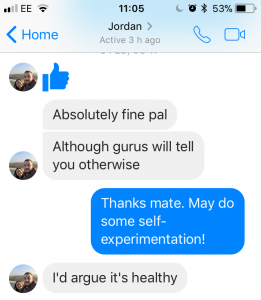 Physiologically and socially, this approached really worked for me during the experiment. Here’s why…. I don’t really eat breakfast. I’ve never been a big breakfast fan, unless I’m on holiday and can relax into it. Usually I’m up early, we’ve got kids to feed/wash/dress/transport and I start work early. Breakfast is an afterthought in at least 80% of cases, which meant eating only two meals was easy. I was having a greens drink in the morning, so ‘breakfast’ was covered. I can’t train very well on a full stomach. I like to eat some food before training, but not a huge amount. Basically I want enough to get me through a workout and not much else. My training doesn’t really require it either. Immediately post-training, I’m usually not very hungry. I can leave eating a big meal for good while after exercise. I’ll usually have a small snack, but not sit down to a big meal for a good few hours afterwards. I like to eat something substantial in the evening, so saving more of my calories for the end of the day works for me. It’s also when Rach and I eat our biggest meal, so it made life socially easier. My general meal guideline was that it needed to contain protein, but also had to be generally healthy because that gave me more volume of food per calorie, something that I later learnt to be key in the success of all of this. What happened when I ate a 1000 calorie diet…. The first day was easy – I was already fuelled from the day before, plus I hadn’t ‘endured’ a few days of low calories, so in reality it felt like a single day of eating only 1000 calories, which is exactly what it was. At this point I had to think a little more. I was hungrier, but it wasn’t too bad. I learnt that if you keep plenty of water handy, you can get away with a little more distance between meals. I wasn’t especially hungry, but I was giving my food choice a LOT more thought. It made my eating far more conscious. When I was picking my early meal it was based purely on volume – which choice would give me the largest volume of food for the lowest number of calories. This was when it started to get tougher. I play football on a Thursday, so knew I was going to need some energy. It was by now that I was missing the snacks I’d usually eat throughout the day and it took some serious willpower (despite me thinking it’s a myth) to not eat the snacks. The last day was easier again, probably because I’d found a way to make it (kind of) work for me. Also the fact that the end of the experiment was in sight made it psychologically easier too. Each of them are valid in their own right and are relevant depending on the lens through which you assess the virtues of a nutritional plan. I didn’t have a bias beforehand – I was simply doing it as an experiment to test accepted wisdom. Thanks to this, I feel like I can offered a balanced opinion on the three effects I experienced. 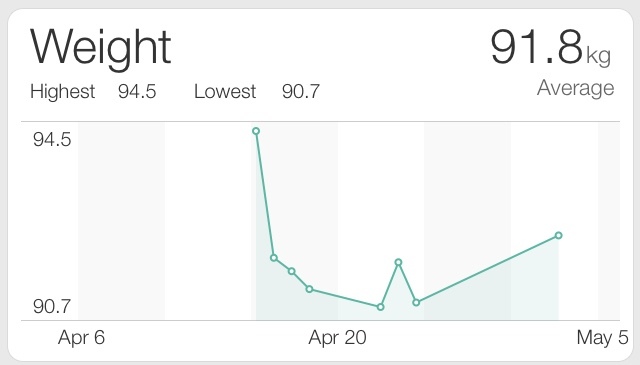 I started the week weighing 94.5kg and I ended it weighing 90.7kg, so I dropped 3.8kg, or just over 8lbs in old money. It’s important to point out that this wouldn’t all have been fat, it would mostly be water weight. My motivation wasn’t weight loss, as I’ve said before. It’s an interesting outcome, but anyone using the approach to simply lose weight would probably be better off with a slower, more long-term approach which would see more fat lost. Once I reverted to my normal eating, I regained some weight, but only around 1kg. With that in mind it’s probably appropriate to recommend this as a kick-start to weight loss, rather than a long term approach. I expected there to be a dramatic effect on performance with the 1000 calorie diet and there was – to a degree. 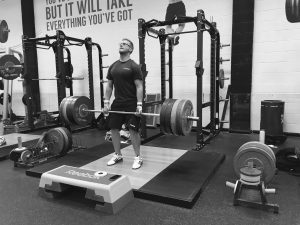 Most of my training is quite explosive, with the vast majority of my training consisting of weight lifting and it’s variations. I do cardio in the form of football (which is very high intensity), but most of the training I do is quite glycolytic (anaerobic or ‘without oxygen’). Basically this means the effort is short, but very high intensity. For this kind of training, I don’t need huge sugar/fuel reserves, so I noticed that as long as I had some fuel on board, I was fine. It was much tougher playing football on the 1000 calorie diet as the fuel reserves required are much higher, so that was a real slog! I coped, but I knew that it really wouldn’t be a good idea for someone who trains using long duration cardio such as running or cycling. This is perhaps the most interesting area to me lately. Following on from my recent no sugar experiment, I’ve become more interested in the behavioural choices we make around food, because essentially it’s just a series of decisions we make each time we come to eat. When following the 1000 calorie diet, I was forced into making different choices. Anyone who is familiar with macronutrients will be aware that when dieting, it is still important to maintain a high protein intake, especially if you are active. With this in mind, I had to ensure my food options were (relatively) high in protein yet low in calories. This isn’t easy. Next up was a volume issue – I had to ensure that I was eating enough to feel as though I actually had something in my stomach. There are tricks to this, such as making sure you drink plenty of water so you stay full etc, but it’s still something you have to consider. Flavour is key too. If you are already eating low calorie, you have to have a least some enjoyment from your food, so I found myself opting for things that at least tasted good! It opened me to a few new options I’d never have really considered before, such as vegetarian curry snack packs – they averaged around 200 calories but contained a lot more food than the meat versions, ticking the volume box! My initial thoughts are that it’s idea for anyone looking to kick start weight loss. Most people wouldn’t cope on it for the long term, but as a short term fix it certainly has its uses. I dropped over 8lbs in 5 days using it. I also think it’s a great behaviour change tool. If you respond well to strict rules around your diet, sticking to 1000 calories is a simple but easy enough one to follow. You don’t have to count macros or follow meal timing rules, you just eat 1000 calories and try to keep your protein high. If you are a competing athlete with a high training volume, then the 1000 calorie diet isn’t for you. 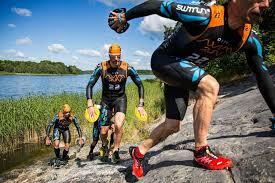 It’s basically impossible to maintain a high training volume on such a low intake of energy. Cardio bunnies would also struggle. By nature of their exercise, anyone who is running, cycling or swimming multiple times per week would really struggle with the 1000 calorie diet. 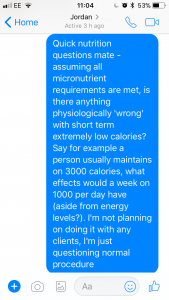 I have given this some thought and think manipulating a 1000 calorie diet for long term use is both possible and practical for anyone looking to lose weight or body fat. The diet would look like a modified 5:2, with the daily base line calories being 1000, from high protein sources. On training days, calories would be spiked relative to the activity and the rate of weight loss, but would revert to the 1000 calories on non-training days. The diet would have to be individually tailored, but I think that approach would work. 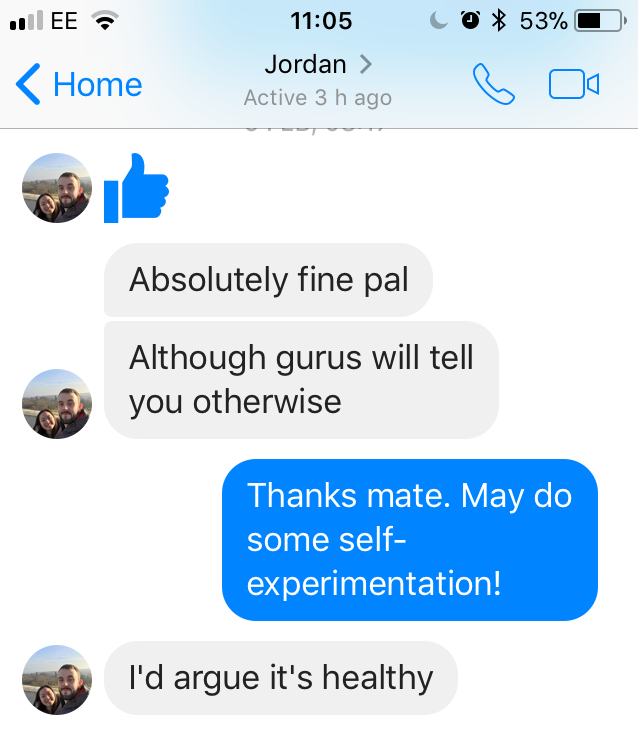 I can’t think of a reason it wouldn’t, but I’ll spend more time on my thinking/experimenting around the topic before I use it as a tool or suggestion for personal training or ABC Programme clients. When you’re trying to sustain yourself on a 1000 calorie diet, you can still train but the type of training that you do needs to fall in line. If you’re expecting to run marathons or cycle for 50 miles on such small amounts of food, you’re going to find it impossible. What you need to do instead is focus on short, sharp bursts of effort. Weight lifting, weight training and some HIIT protocols will work. 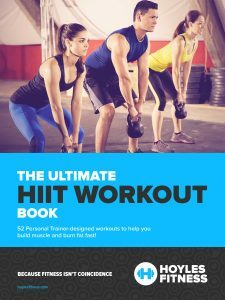 The kind of workouts I was doing on my 1000 calorie diet are the ones in my HIIT eBook. I did some of these workouts on 4 of the 5 days I was eating the 1000 calorie diet and found them to be tough, but I could cope. It’s because the nature of the workouts are that they are short, but intense – perfect for when you’re only eating 1000 calories per day! The first conclusion to draw regarding the 1000 calorie diet is that yes, it’s totally possible to live on 1000 calories. There are performance issues, but if you have weight/body fat to lose, it’s very much an approach that can work for you. I safeguarded by dramatically increasing my micronutrient (vitamin and minerals) intake, so I felt great doing it. A lot of our behaviour around food is purely habitual, so forcing a dramatic change in your behaviour around food makes you really think about the choices you make. As a long term dietary approach, it’d need some manipulation in order for it to be a suitable long term option, but I honestly think with a level of self-control and discipline, it’s something that could work for most people. As long you ramped-up calories around activity, it’s a diet that would prove very effective for many. Many thanks for posting this informative article. 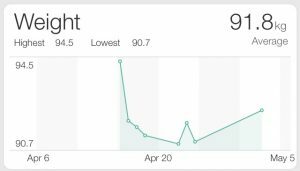 I’ve a lot of weight to lose (~30 lbs), and plan to follow the advice in the article to do it. Plan to skip breakfast and eat calories over 2 meals, fuelling workouts. Glad the article has been informative for you. It certainly helped me to lose some extra weight, plus it re-framed how I looked at food. If you need any help give me a shout! Looking to do this post Xmas and new year for a way to get back on the healthy eating track! And also have a holiday in 3 weeks. Won’t lose the amount I need to but I think it will help lift me! My main problem is sugar addiction though. How would you recommend getting through it when I feel weak from not eating the sugar? Good luck with it – I’m sure you’ll do well. What you need to think of with the sugar addiction is how you can reframe the ‘addiction’ in your mind. Have you read my post on when I went without sugar for 28 days? Skipping breakfast is not a good idea!any nutritionist will tell u that. If you were up to date on the research you’d know this. I skip breakfast & feel super energized during my workout. Eating beforehand doesn’t work for me. That’s interesting, Kimberly. A lot of people report that. Personally I think I’m better off with a little food on board before I train, but not too much. Saying that, I know people who train on an empty stomach all of the time! I’ve been told b y many people that dropping under 1200 calories is bad for health but I did a 1000 calorie diet as well. For me this diet was long is term (4 months if that’s long term) and I will say with the right balance it worked for me. I counted my macros and ate my vitamins and in the end lost 53 lbs in the time span. Most of which were fat and some water. I do not recommend this diet without at least some exercise because I muscle mass is easily lost, I’m not saying do a full on work out 4-5 days a week more like go for a walk and do some yoga. You cannot be a couch potato! Personally I went to the gym to lift weights/do upper body workouts once a week and did half an hour walk in the afternoons 2-3 days a week. It’s nice to see that someone else agrees that it’s not as dangerous as people think. I wouldn’t listen to what those people say and go with your own experimentation. If you feel good when eating lower calories and it’s working for you (as it sounds like it is doing), then stick with it. I think occasional re-feed days where you eat more calories will be a good idea too. It’s certainly not dangerous, as long as it’s done for the right reasons! I have been on a 1000 calorie diet for 2 weeks and will continue to be on it for about 9 weeks longer. I started at 6 feet 5 inches 310 pounds. Wide athletic frame (I played lineman in college at a D1 school). My diet and intake is the same food every day. The biggest key to keeping this diet is WATER WATER WATER. NO SUGAR DRINKS EVEN IF DIET. ONLY WATER. Also if you’re going to cheat don’t do it. You have to commit to this diet in order to maintain it lot a long a long period. The other key, PORTION CONTROL. Prep for 2 weeks at a time and sit there and measure and weigh every piece of this meal. I’m not sure of my weight loss as of yet because I refuse to step on the scale until I hit my goal of 9 weeks. But I can tell you it does feel so much better living and eating this clean. Well done Cameron! Sounds like you’re doing really well! I’d love to hear how much weight you’ve lost when you do step on the scales again – my guess is it’ll be a lot! Hey Steve! So nice to read on actual people. This plan is speaking to me. I have to lose weight and have about eight months to do so. Basically planning on the 5:2 or maybe 6:1 and the one being a cheat day. I have been feeding off of fast-foods for a while now and need to shed all this laziness away NOW. Thanks so much on including the importance of multivitamins, I am also working ordering and becoming healthy. If you have 8 months there’s plenty of time to make a significant difference to your weight! Are you thinking of going with 1000 calories as a plan? It’s something I coped with (even with a pretty intense exercise regime), but you do need off days to cope with it. As long as you stick to your plan, stay strong you’ll be fine! I like this diet, personally I find it better than 5:2 as you do similar each day. For me that day to day consistency is easier to maintain. Pretty easy to do and defo not hungry. If it’s a training day I look to add calories to roughly match the burn. That’s great that it works so well for you, Lee. Also you’re doing the right thing by upping the calories on training days. I unintendedly changed my eating behaviour 2 weeks ago into a ~1000kcal diet and wanted to thank you for this article. Was a bit scared when I did the math today. Felt no disadvantages at all, not hungry etc.. Just a pretty fast weight loss (1,80m / 102kg to 96kg in 2 weeks) without any cardio/lifting sports. A friend of mine showed me how much vegetables, rice and chicken you can eat compared to a bag of chips – so I started cooking for myself, stopped eating sweets and chips, changed to diet coke when i feel the need for something sweet (getting more and more rare). I eat the same amount of food but only take in ~30% of the calories. Right now it’s mostly just throwing everything into a big frying pan with some olive oil while cooking some rice and it works great for me. Trying out new vegetables is a great experience since I am not a picky eater. I don’t know if this is a worldwide thing but here in Germany we have Uncle Ben’s rice that is microwaveable, works like a charm, so you can cook in under 5 minutes with only veggies and 10 minutes with some chicken/meat. Hey Martin! Thanks for your lovely words about my article – glad it in some way has helped you! Great to hear about your rapid weight loss. If you’re feeling healthy and not hungry then it shows it’s an approach that’s working for you. Yes, we have Uncle Ben’s rice here too. They do a lot of great flavours, plus it’s so quick and easy. It’s a tip I think a lot of my readers would like to know, so thanks for sharing it! Congratulations again on your weight loss and new healthy lifestyle! I am so relieved that someone finally says 1000 calories are ok to lose weight. I kept the 1200 years ago and it worked fine but i was trying to see now if 1000 calories are better. Need to lose some weight fast as is giving me the boost to continue working out etc…i mean fast results to not be descuraged. Thanks again , loved your article. Thanks for the lovely words and congrats on the change in lifestyle! If ever you need some help, give me a shout! Hi! Thanks for your article, it’s very informative. I am a woman with 35 extra kilos. I started a 1000 calorie diet 4 days ago. Today, I noticed that I lose 1.5 kg, but I gained 1.1 fat% and lost 0.8% in muscles. I must admit that I did not workout. I was very sedentary. I appreciate very much your advice. Keep going with it – if you stick to the principles you’ll lose weight. It’ll get there, just stay strong! Thank you for the article. I’m a female 5’8 with around 20kg extra weight on me. I have a sugar and flour addiction and even though I want to lose weight more than anything, I have this fear of going on a low-calorie diet and exercising. I fear to feel fatigued or go hungry. But it just shows how much I’m afraid of letting go of food. But now that I’ve read this article and other peoples’ experiences, I feel so much better for trying 1000-1200 calorie diet and hitting a gym 3-4 times per week also. Hey man, great post. Glad you added the “after” part, when some weight comes back. People generally are scaring each other with low calorie diets, that you are going to get all the weight back, it’s true, to some extent, you’ll get probably 5 out of 15kgs (generally it’s the 1/3) and if you eat below maintenance, the amount will be fewer. Eating that amount of calories it’s way better than waiting months for some results. Kickstart is the keyword, great post once again! I can understand your issues – I work with a lot of people who have issues around food. You’ve made the important first step though, which is make a plan. Once you’ve psychologically decided to shift the weight, you’ll do it. The whole process begins with the mind, so remember to keep your focus on what you’re doing any why you’re doing it! Glad you liked the post Manuel! I think it’s important to show people a ‘real’ version of events and not the edited one. Yes, you’ll gain a little weight, but nothing like people report or imagine. This 1000 calorie diet is a perfect way to kickstart your weight loss I’ve found.